We Love Rentals® are different because we are focused on you – 100% committed to managing your property with great service and great results. We are so sure that we can provide you with the service you want, that we are offering you to try our property management services for free for the first 2 months! Our property managers only do property management. Period. Because that’s all we do, our team are able to focus on providing a specific, specialist property management service – so you receive our prompt and efficient service every time. And the best part? You only ever have to deal with one point of contact – your personal property manager, no leasing consultant or assistants. Whatever your goals for your property; from securing a long-term tenant to finding someone to look after your home while you travel, your property manager will make sure that happens. Most traditional real estate agencies manage between 120 and 150 properties each, with the state average being 130 per Property Manager. We understand that when our workload is higher, your property gets a lower service – so we decided to do things differently. 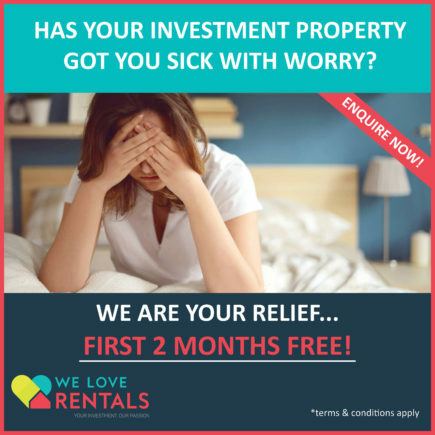 We Love Rentals® cap our managements at 80 properties per property manager and that’s the way it’s going to stay – because your service and your property will always be our priority. Most WA property managers have access to only one database but We Love Rentals® has access to all three – so you can be sure your tenant has been thoroughly checked before they rent your biggest asset. We make tenant selection a top priority because we know a bad tenant means problems for you and your property and we take that seriously. To combat that risk, we have access to all three, nationally recognised databases. If they’re on any tenancy database, we’re going to know about it! It’s quite simple; you want a great service, good tenants and the best possible rent. We know that to make that happen for you we need a good team who enjoy their work and are paid well. We have created a team who love what they do and are dedicated to achieving your goals and meeting your expectations – and we know this because we track it. Our property managers have daily performance indicators (KPIs) they must achieve in order to receive their salary bonus. Their targets include client satisfaction, completed inspections, rent arrears and signed lease agreements. We Love Rentals® have tried and tested this method and it works – you’ll notice the difference! Just like our property managers only manage properties; our trust accountant only does trust accounting. You don’t just get the default option of receiving the rent at the end of the month, you can be paid out as little or as often as you like – whatever works best for you. Aside from being paid at the end of each month you can be paid weekly/ fortnightly to match the timing that your tenant pays their rent. After all, it’s your money so we will give it to you when you want it, you won’t be made to wait until we are ready. We Love Rentals® charge two fees and two fees only for our all-inclusive property management service. A Letting Fee – only charged when a new tenant needs to be found. This is one single fee and doesn’t change throughout the letting process. Professional photography – we believe that this should be a standard and not a feature. Placing your property as a Feature listing on Realestate.com and REIWA.com, among other websites. This keeps your property on page one for longer and tenants will view your property before the rest of the market. If an interested tenant calls and wants to meet us at the property in 20 minutes, we will be there. It’s our policy so your property doesn’t miss out on a potential tenant. Tracking and contacting tenants who have registered to view your property but could not attend. If your Property Condition Report takes us 3 hours or 6. A thorough, 1-hour induction with your tenant at the lease signing. If we need to arrange our tenant sign-ups and inductions after hours. We simply do everything needed to get your property leased- the extras are just a part of our standard. We Love Rentals® will only charge you ONE management fee which includes everything we need to do manage your property. We don’t cap on the number of quotes we need to arrange, we don’t cap on re-inspections or insurance claims that need to be done; basically, we don’t cap on anything! We simply manage your property the way you would like it to be managed. Traditional agencies in WA will charge you for each day to day task separately and then throw in a miscellaneous fee for all the fees they haven’t thought of. In many agencies, even those property managers, who sign you up on an “all-inclusive” basis, will not include court attendance, processing insurance claims, re-inspections or even arranging quotes. We have everything covered under the one simple fee. Apart from our fee structure being simple, it is also very safe. Whenever we pay you the collected rent, you will always know exactly how much is going into your account. You have peace of mind in knowing how much there will be to pay the mortgage at all times– even if you go on holiday. We understand the frustration that clients feel when their phone calls aren’t returned. To us you are a priority and all your phone calls will be responded to within a reasonable time frame. How can we guarantee this you may ask? It’s simple. We always find the time to call you back because our property managers care about you and your property – and we’ve made sure they aren’t too busy managing a hundred other properties. We are a family-owned business and understand the value of integrity and quality customer service. We are confident our property managers will give you a top-quality service, but if you do ever need to speak with Sarah or Janine, they are only a phone call away. Too many property managers are opting to use all-inclusive trades companies because they don’t have the time to research and arrange maintenance with individual companies. These types of companies will then add an extra portion onto their bill which you will end up paying for. We only use individual tradesmen who can offer quality at reasonable prices with a personal service, so you and your tenants will be satisfied. As a part of your property manager’s KPIs, they will email you a report after every viewing. The report details the prospective tenant’s name, comments on what they are looking for and if they think your property suits their needs along with an indication on if the tenant will be applying. Furthermore, your property manager will be in contact at least once per week to discuss the viewings in detail with you along with a full written report weekly – so you always know what’s going on. Your property is our priority – and we love what we do. Want to discuss handing over the management of your property to our team? Talk directly to one of our property managers on 6254 6300.